Kitchen and Residential Design: Cuban tile isn't encaustic, it's cement. It's not really cement either, it's concrete. Cuban tile isn't encaustic, it's cement. It's not really cement either, it's concrete. For as long as I've lived in Florida, I've been enamored with what's known in these parts as Cuban tile. Cuban tile was all the rage in Florida from the turn of the last century up until the 1950s. The embargo against Cuba pretty much sealed its fate as a lost material until fairly recently. I live in an old neighborhood and this house is down the street from me. Wild as it is, all that Mission-style mish mash and stucco is original and that house is about 70 years old. The front porch had been closed in at some point after the advent of air conditioning, but if you look in the door you can see what's on the floor in there. It's an original Cuban tile floor. 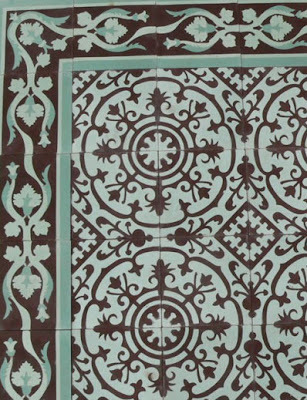 I've written about Cuban tile before though it's been quite a while. 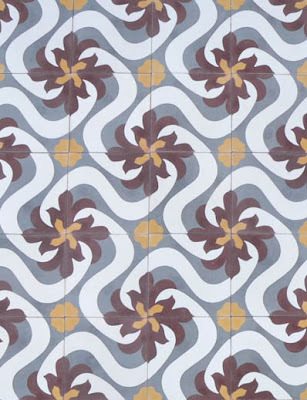 All this time, I've been using the terms Cuban tile, encaustic tile and cement tile interchangeably but it's come to my attention recently that encaustic and cement tiles are very different things and to split the hair even finer, cement tile's more accurately called concrete tile. 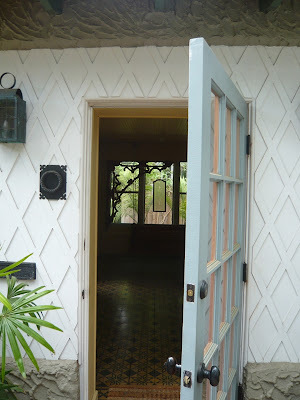 Zoe Voigt, a writer and great friend of this blog, explains the differences thoroughly in an article called The Difference between Encaustic and Cement on Tile Style. In the comments that follow Zoe's post, Richard Holdshuh explains that cement tile isn't really cement after all. It's concrete. Richard's opinion is backed up in a follow up comment left by Jorge Aguayo of Industrias Aguayo. Industrias Aguayo is one the world's few manufacturers of concrete tile. From their factory in the Dominican Republic, Aguayo keeps alive the Cuban tradition through a concrete tile series they call Herencia Cubana. That's Cuban Heritage in English. Bill Buyok, another friend and occasional contributor to this blog, happens to sell Aguayo's Herencia Cubana from his fashionable shop, Avente Tile, on Wilshire Boulevard in Beverly Hills. I think we can safely call it Cuban Tile 90210. Bill's Flickr stream is where I got these images of traditional Cuban patterns that are back in production and readily available. 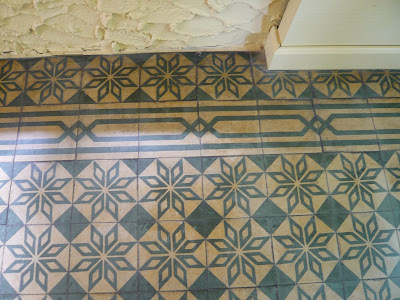 So the next time someone asks, Cuban tile is cement tile and not encaustic tile. And it's not really cement tile either, it's concrete. Got that? I've mentioned that I used to sell tile at a high-end showroom, but ours was more the Walker Zanger and Ann Sacks stuff. About seven or eight years ago I wrote an article for Flair magazine (Tampa Tribune) about cement tiles. 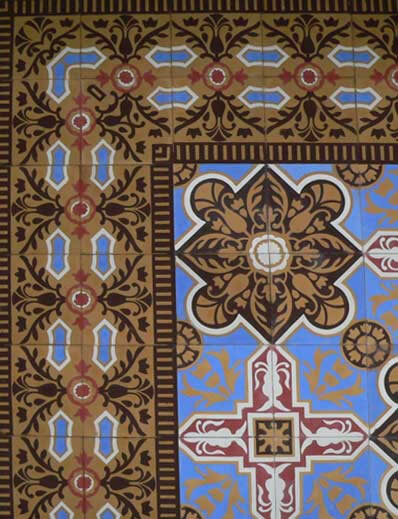 They are called Cuban Tile in southern Florida because of the Cuban population who came to the US and brought over the technology at the end of the 19th and early 20th centuries. Cement tiles were manufactured in the US until they went out of style in the late 1950s. So Cuban Tiles is a fine name for them, especially those pretty Cuban heritage ones made by Aguayo Tile! Since then I've written extensively about cement tile (and other types, too) and I've also visited several factories where the tiles are made. I've interviewed many owners of factories that have been making cement tile for generations, and that's what they call it. Cement tiles ARE made of concrete, as concrete countertop expert Richard Holschuh accurately points out, but the industry standard name is "cement tile." As Jorge Aguayo points out, cement is a main ingredient in the tiles. Perhaps cement tiles haven't been called concrete tiles to differentiate them from concrete pavers? There's a company called Smith Laredo that you're probably familiar with that makes lovely concrete tiles. Those aren't hydraulically pressed and the pigment is full-body. Thanks for the post--it's nice to have friends that are passionate about tile too! Hah! 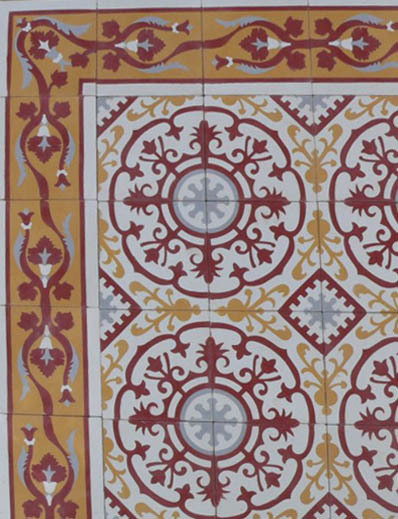 What's wild is that the Spanish/ Cuban version of concrete tile plays with Moorish motifs in a not so subtle way. This stuff would make perfect sense if you're aiming for something that will invoke the feel of Morocco. Well Zoe, I owe the topic today to you! Wow Paul - these tiles are beautiful. 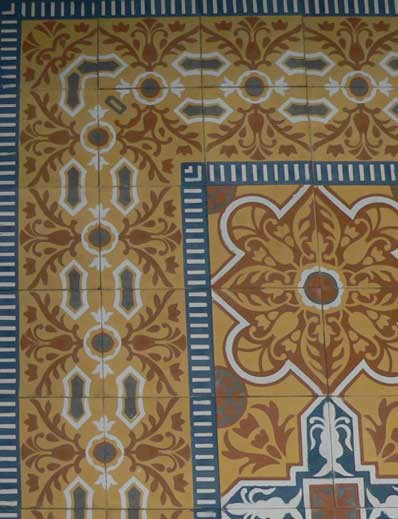 I love the patterns and more subdued colours of cuban tile. Donna: Thanks for chiming in. It's an amazing art form and I'm thrilled to see it making a comeback. I heard of encaustic before Cuban (okay,I never heard of Cuban or cement.) I remember when you pointed them out to me. Some of these I'd enjoy using. 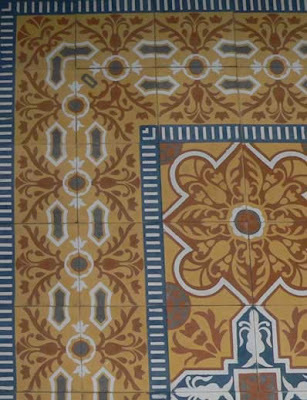 Thanks for giving us a great glimpse at an unusual historical cement tile pattern. Kudos to you, Zoe, Richard, and Jorge for promoting the cause to help explain what cement tile is and is not. A Herculean task indeed. The showcased cement tile in the "Mission-style mish mash home" is a unique example. The pattern uses only two colors in a neutral palette and the field pattern is used inside and outside a border. That took some planning. It also showcases the amazing durability of these tiles and one reason they are a green product - 70 years is a darn good design life. Use Cuban tiles instead of carpet and your carbon footprint just got a lot smaller; so did your total cost of ownership. 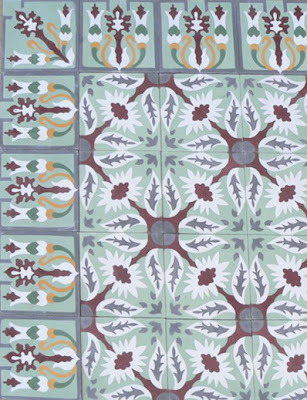 I really appreciate your kind support of Avente Tile's handmade cement tile and Aguayo's lovingly restored Cuban Heritage cement tile patterns that we offer online. We love to talk (cement, Cuban, concrete) tile! Kelly: It's a perfect match for the Mission-style in CA. Bill: It's my pleasure and if you ever find yourself on this coast again, some of these original floors can't be missed. Seeing the originals confirm the ideas driving the current resurgence of this material. Yes, there's a reason that many of the designs look Moorish. 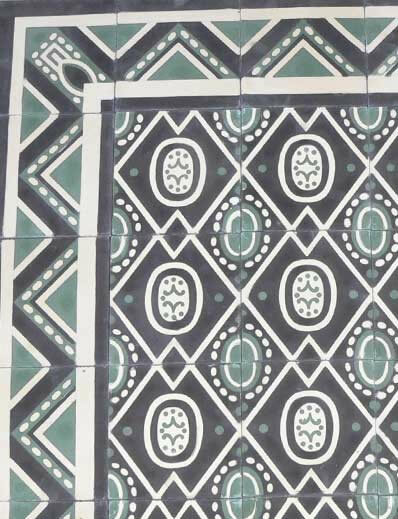 Cement tile was used as ballast on ships coming to the New World from Spain, Portugal and Northern Africa. 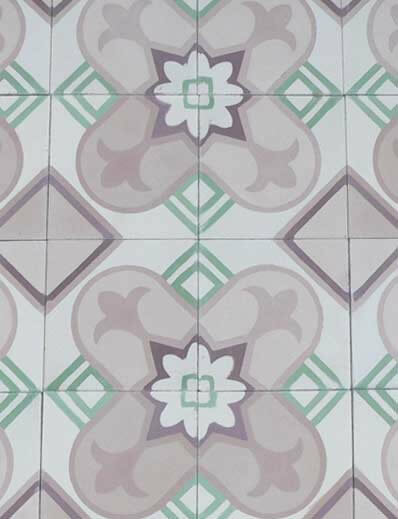 These days, cement tile is made all over the world. It is most popular in warmer climates, although that seems to be changing. The US is catching on again, and for about 25 years now, cement tile seems to be making a comeback. The nice thing about them for designers is that they are so customizable. You can design your own pattern or use an antique one and play with different color combinations. So if you like subdued colors, you can have them. You can use them as field tile or make them into rug patterns in the middle of rooms. If you want mish-mash, or lots of color and pattern, you can have that too. They allow for so much creativity! 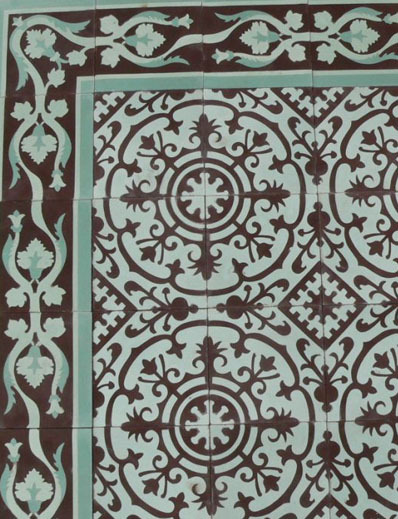 These are beautiful tile and due respect as to the craftsmanship and artistry involved in designing/making them. Timeless is timeless. As a person who is passionate about historical tile and historical processes, I am thrilled by the interest in understanding what different types of tiles are about. New tile trends are exciting - but decades-old tiles that can make you want to live with them are what tile is really about. just need to figure out how to make these work in my more traditional suburban home. Or better yet, just pretend I'm in the exotic locale of Morocco or tropical Cuba. Sigh. Zoe, Cyra and nkp: Thanks for your comments. And speaking of beautiful tile, just wait until everybody sees your Cyra. There's a profile on DuQuella in this blog's future. Paul - So good to see this conversation continued and the wealth of information flowing from so many sources on this topic. Beautiful tiles made from a wonderful material: an incarnation of quality. I am glad to see that the medium and style of Cuban tile is enjoying a Renaissance in production as well as popularity. While I fully realize that my semantics about cement/concrete definitions will not change "industry standards" (at least not single-handedly! ), it's always good to get the info out there and let inquiring minds assimilate all the bits and gain in knowledge. Good to hear from Zoe, Bill, Jorge, and you, Paul, the gracious emcee. I have published three books on the design of such tiles for Pepin Press and I consider myself rather an expert on the subject. Even though I come from Cuban heritage, I am sorry to inform that there is hardly anything Cuban about these tiles. 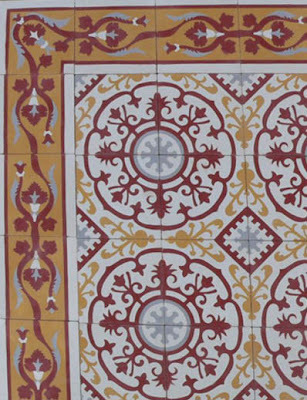 These tiles where invented by a combination of techniques originated in France, Italy and Spain. Spain made them popular at the turn of the 20th century and they arrived to old Portuguese, French, and Spanish colonies through out Asia and Northern Africa and Latin America of course. They are also found in many other parts of Europe. One attribute I can give to Cuba on this subject is the fact that the political situation of the last 50 years have accidentally help preserve many of these beautiful floors. Maybe the ones found in Florida came from Cuban factories, but that's about it. Nowhere in the world except for the US they are called Cuban tiles. Not even in Cuba they are considered their invention, the historians in the island know for a fact that the first ones came from Spain until they opened Cuban factories in the beginning of the 20th century. I hope this helps clarify misunderstandings. Thanks! I've always known that there is nothing uniquely Cuban about these tiles and the current rivial for them in Florida is being fueled by factories in the Dominican Republic. Since Cuba was the Spanish colony closest to Florida and after independence enjoyed a rigorous trade with the ports in this state, the market here was flooded with tile from Cuban factory. The Cuban influence on Florida is as broad as it is deep. A lot of that influence is actually from Spain but Cuba gets the bulk of the credit. Where are you now? Are you in Cuba, the US or elsewhere? Greetings from the Dominican Republic! I'm kind of disappointed that I only got to discover this great discussion today! 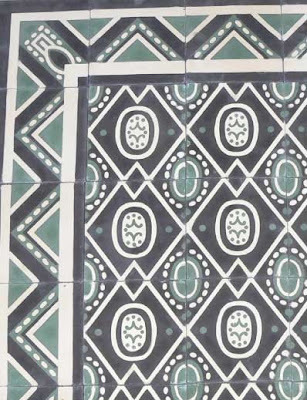 It is really awesome that cement tile has made a comeback such as this. If any of you would like to see what the manufacturing process is like at our plant just go to youtube and type in Mosaicos Aguayo. Better late than never Jorge, thanks for joining in. I'm going to run your comment and the video you mention as its own column tomorrow. So happy I found this blog. 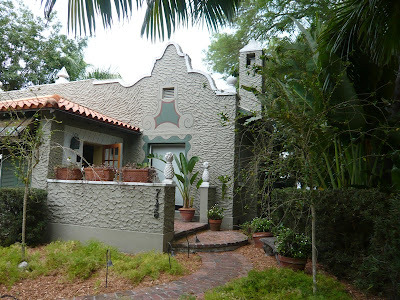 I am renovating an old Spanish Mission house in coconut Grove, Florida. 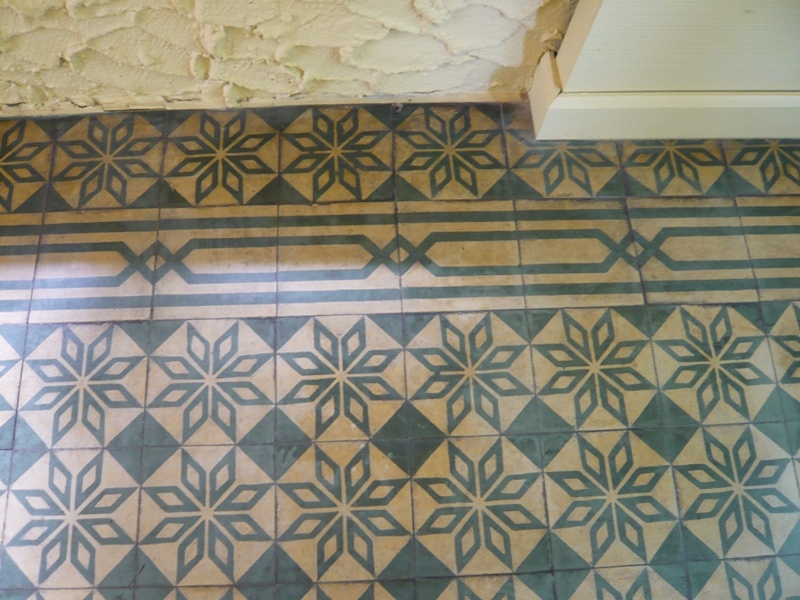 I am planning on using encaustic tile if the budget allows. I'm glad you found it too Sally and congrats on taking on a real, Coconut Grove original. I love that neighborhood and please let me know if there's anything you'd like me to write about that you might find useful in your renovation. Keep in touch and let me know how your project's coming along. Ok, fine....I agree, its beautiful tile (no matter their origin) but my big problem is maintaining this 60 year old Cuban tiled floor in Miami Shores! If I bring an expert to "re seal it", the cost will be very high and I will have to do it every 3 years. Any suggestions for a DIY solution? I actually own an industrial floor polisher.....I jsut dont know what product to use with it so that I dont damage the floors original colors.